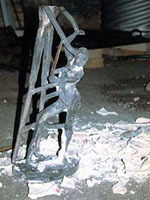 Bruning Sculpture's foundry can provide casting and fabrication services for artists. We use the shell cure perdue (lost wax) method to insure detailed surfaces. We also use resin bonded sand for larger castings. 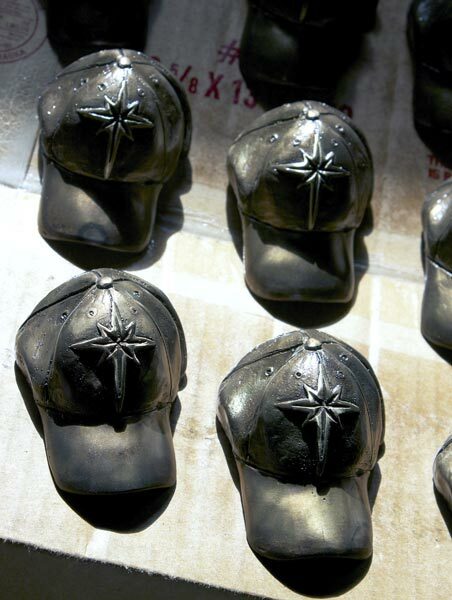 We provide chasing and patination in numerous color variations. We pour both silica bronze and aluminium. 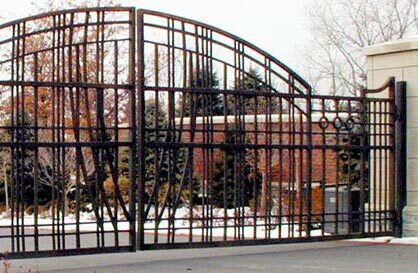 Bruning Sculpture, Inc. fabricates sculptures in steel, aluminum, stainless steel, and bronze. Casting and fabrication can be used together from small to monumental sizes. 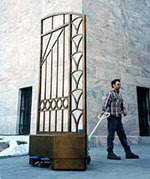 Bruning Sculpture can provide an understanding of material and process guided by the artists' creative intent. Please contact us for further information on schedules and costs. Front security gate to private residence near Lake Cunningham in northwest Omaha, Nerbraska. A matching fence was also made for the property's lengthy surrounding perimeter. Created in 2004 as an restaurant attraction off of I-80, stands atop a 40 foot pole at the 27th Street exit in Lincoln, NE. Omaha Neon helped with the installing of this gargantuan, burger lovin' ape. If you've ever headed to a Husker game from Omaha, chances are you've seen it. Commissioned by Omaha's Joslyn Art Museum to fabricate art deco patterns in the new atrium, designed by Sir Norman Foster, to help unify the old section of the museum with the new. Work included several 10 foot bronze space partitions, café signage, and three poster display frames. Bruning Sculpture also handles large scale dental work for elephants at the Omaha Zoo. Custom tusk caps are cast in white bronze, and installed onto the tip of the elephants tusk--protecting them from rot and disease. The children of Lincoln, Nebraska, along with the Lincoln Arts Council, established the Pennies for Lincoln Project. The children saved pennies to pay the cost of casting an original 8 foot tall sculpture of Abraham Lincoln. It was created in plaster by Louis Slobodkin and first displayed at the 1939 World's Fair in New York. Slobodkin's son was present for the unveiling. The casting of a life-sized plaster female, entitled Bathsheba, by Slobodkin, was completed for the Sheldon Memorial Art Gallery. Designed and fabricated architechual details including spires, cross, ribs, gargoyles, and both interior and exterior light fixtures. Worked with Wilson Custom Tile on the design and fabrication of many pieces of furniture within the chapel. Created many castings from original objects (i.e. baseball gloves, golf clubs, bill folds, camera, suitcases, hat boxes, plus a leather mail carrier bag) to be used in interior and exterior designs by T. Delaney/SEAM Studio. 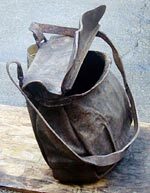 Other projects included paper bag planters fabricated in fiberglass, and five foot tall rope bollards cast in bronze. For museum display purposes, we used a rubber mold from an original Degas ballet sculpture to recreate wax, plaster, and bronze reproductions. These were displayed at a major Degas exhibition at Joslyn Art Museum in 1998. 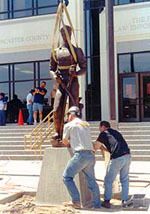 This 12 foot tall bronze sculpture was enlarged from a paper maquette, and fabricated in 3/8th thick silica bronze sheet. Services included patination and installation on-site. This is one of several projects with Catherine Ferguson. Want sculpture? 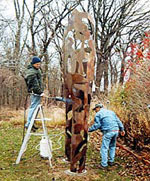 As a service to you, Bruning Sculpture can lease outdoor pieces for 1 year at 10% of the sculpture's value. This can be applied towards the purchase of the sculpture if you decide you want to own it.